Indie Retro News: Indiana Jones and the Last Crusade - Lucasfilm Games Adventure C64 port gets an update! 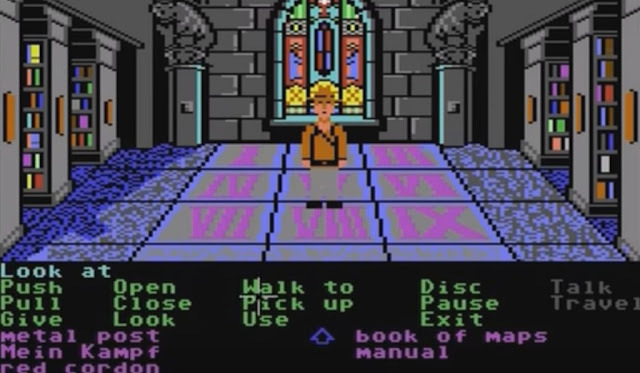 Indiana Jones and the Last Crusade - Lucasfilm Games Adventure C64 port gets an update! Last year we gave you the special heads up news of the C64 work in progress adventure port of the classic game "Indiana Jones and the Last Crusade ", which appeared on the Amiga, PC, Atari ST and Mac. Well fast forward to today and we've just been told by Retro Nerd, that Brick Bami has finally released a new in development tease that shows a number of improvements over from the previous video. As we said before this latest port was never originally released on the C64 and as such the developer hopes to push the game to a feature packed title and one that most C64 owners would be proud to have in their collection. 1.) pathfinding via walk boxes in classic "rooms"
So keep an eye on this one, I think this is going to be a big hit with the C64 crowd when it finally sees the light of day!